In our industrial engineering tutorial series, we are sharing operation bulletins for various products. In today's post we are sharing an operation bulletin of a Hoodie (fleece pullover). 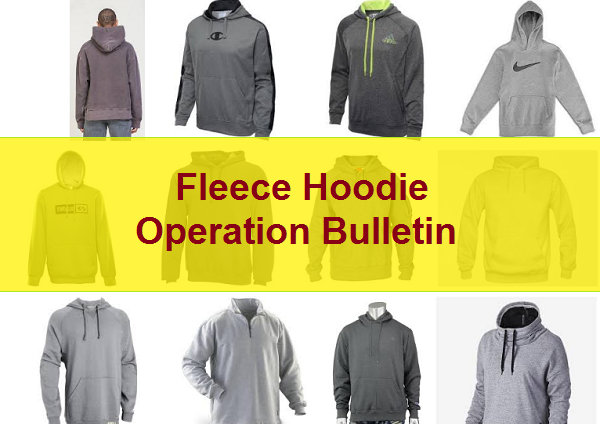 You can refer this operation bulletin to learn about various operations involved and machine requirement in making a hoodie with kangaroo pocket, draw cord. If you are wondering how to make an operation bulletin read the process of making an operation bulletin. An operation bulletin of a fleece hoodie is shown in the following table. In this OB, operations list, Estimated time, machine requirement, manpower requirement and hourly production target quantity at 80% efficiency are shown. Disclaimer: The estimated time (SAM) shown in the above table will vary according to the product design, method followed and machine and equipment used in actual production. So be careful while you use the above estimated time against each operation. The number of machines and manpower requirement depend on the product SAM and daily production target. 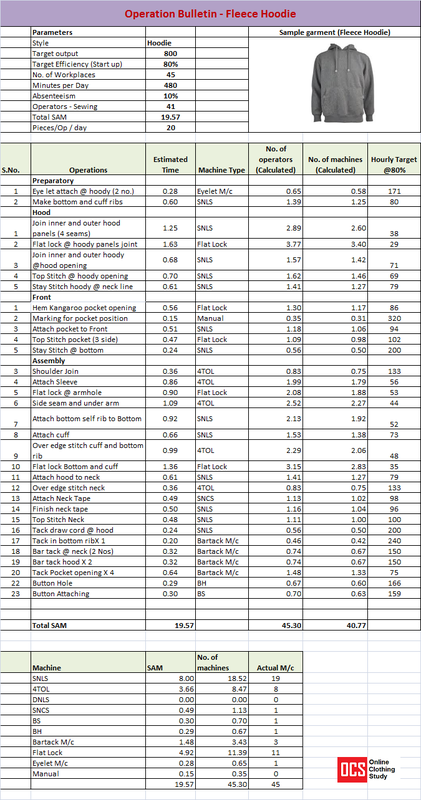 List of sewing operations, estimated operations time and machine types required for making fleece hoodie.